NOTICE: Action is needed to continue receiving this newsletter. The Water Links newsletter is moving to a new distribution platform starting with the next publication, and use of this email listserve will be discontinued. Due to privacy concerns, most email addresses in this listserve will not automatically be transferred to the new platform. To continue receiving this newsletter, please complete the contact submission form on the WMWA website at: www.westmetrowateralliance.org/contact.html and sign up to receive Water Links. In natural landscapes, leaves blanket the forest floor and eventually become rich soil. But as we have interrupted natural water and nutrient cycles with our homes and other “people spaces,” much of the land is covered by impervious surfaces like streets, parking lots and roofs. Instead of water and nutrients making their way in to the soil, storm drains expediently send leaves and stormwater runoff directly to our lakes, rivers and wetlands. Autumn leaves may not seem like a pollutant, but leaf litter contributes a significant amount of phosphorus to urban stormwater, which then feeds algae and depletes oxygen in our lakes and streams. The good news is that the solution is simple: rake up leaves and keep them out of the streets. Removing the leaves from streets can reduce phosphorus concentrations in storm water by over 80 percent, according to a U.S. Geological Survey study. The study found that if it’s not removed, leaf litter and other organic debris in the fall contributed 56 percent of the annual total phosphorus in urban stormwater compared to only 16 percent when streets were cleared of leaves prior to a rain. 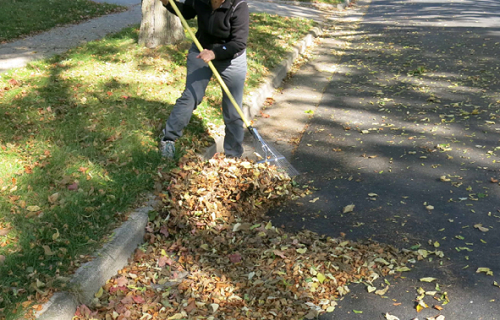 Although city crews sweep the streets, city sweeping isn’t always timed well to capture the majority of leaves. To help keep water clean, residents are asked to keep the street in front of their property leaf-free and to encourage the same practice by neighbors. Remember: clean streets lead to clean water! The Shingle Creek and West Mississippi Watershed Management Commissions are testing a promising new method of reducing phosphorus and bacteria in stormwater runoff. High concentrations of bacteria in lakes and streams, particularly certain types such as E. coli, can be harmful to human health. Excessive nutrients such as phosphorus can lead to algae blooms that make lakes and streams ecologically unhealthy and recreationally unpleasant or even unsafe. In urban areas, common sources of bacteria include pet and wildlife waste and sanitary sewer overflows and leakages. Phosphorus is found in plant and leaf litter, soil particles, pet waste, and fertilizer. Although it’s important to reduce these pollutants from individual yards and lots as much as possible, sometimes it’s more efficient to remove them from stormwater runoff that collects during a storm. That's why the watershed commissions are studying a new way to remove pollution from stormwater using a very old technology: sand filters. By adding iron filings and biochar (an engineered type of charcoal) to the sand filters, they hope to remove a significant amount of bacteria and phosphorus from the runoff before it reaches the stream. This research project is testing three different applications of the augmented filters: stormwater pond benches, storm sewer catch basin inserts, and a filter box. An iron and biochar enhanced sand filter on a stormwater pond in Crystal’s North Lions Park. When the pond level rises, water will percolate through the sand filter for treatment before being discharged from the pond. In the lab, experiments at the University of Minnesota and Stanford University have shown that adding iron and biochar to sand filter media can remove much of the dissolved phosphorus and bacteria from simulated stormwater runoff. This project will monitor the water quality in the ponds and other filters to verify that this method also works in the real world. This research project is funded by a grant from the Environmental Protection Agency through the Minnesota Pollution Control Agency and by the Shingle Creek and West Mississippi Watershed Management Commissions. Learn more. Be on the lookout for new Bassett Creek crossing signs this fall as the Bassett Creek Watershed Management Commission (BCWMC) aims to raise awareness and connect residents with nearby waters. Knowing about nearby creeks can encourage people to consider how their actions directly impact the health of lakes and streams in their communities. Bassett Creek and other waterbodies can use some extra care because rain and melting snow washes leaves, grass clippings and road/sidewalk salt into the creeks, causing pollution. To counter these stormwater runoff problems, BCWMC is implementing two educational efforts this fall. One small step is to raise awareness of our natural resources by placing Bassett Creek crossing signs on key roadways with a reminder of how everyone plays a role in clean water. Training is necessary because winter maintenance of sidewalks, roads, and parking lots currently relies heavily on the use of salt (sodium chloride or “chloride”) to prevent and remove ice. The chemical properties of sodium chloride make it effective at melting ice, but these properties also cause it to dissolve in water and persist in the environment. The dissolved chloride moves with the melted snow and ice, largely during spring warm-ups, and ends up in the lakes and creeks. Elevated chloride concentrations have been found in water bodies throughout the Twin Cities Metro Area including Bassett Creek. Bassett Creek is listed as an “impaired” water because it exceeds water quality standards, and the excessive chloride is toxic to aquatic life. “The typical mindset is to over-salt sidewalks and parking lots to minimize safety concerns. The reality is, however, the overuse of salt doesn't make the area safer, it just wastes money and pollutes water,” says Laura Jester, Bassett Creek Watershed Management Commission Administrator. “Salt in our lakes and groundwater is an increasing problem and part of the solution is proper application. Once chloride is in our water, it's there for good. It only takes a teaspoon of salt to permanently pollute five gallons of water,” added Jester. The good news is that simple actions taken by every resident can improve the creek – whether it’s keeping leaves out of the street, or snow shoveling early and often to reduce the use of winter salt. Together we can make a big difference. Clean water really does start at everyone’s front door. The Watershed PREP (Protection, Restoration, Education, and Prevention) lesson combines a fun hands-on activity and presentation to lead students to answer a tough question: "Why do our lakes have so much algae today?" Through a series of historic photos, the students will witness how the landscape around their school has changed from pre-settlement to today, and how that has changed the threats to our watershed. The lesson is a wonderful way to connect with kids through science. Students show an interest in the program because it relates directly to their neighborhood, schoolyard, streets, rivers, lakes and parks - all places where they live and play. Watershed PREP aims to have students gain an understanding of watersheds and water resources and the connection between their actions on land and the quality of water in our lakes and streams. In 2016, Watershed PREP educators visited 127 classes with a total of 3,374 students! We’ve worked with over 30 schools in the Anoka-Hennepin, Brooklyn Center, Elk River Osseo, Robbinsdale and Wayzata school districts as well as several charter and parochial schools. Can we add your school to the list?! Contact WMWA at info@jass.biz or 763-553-1144. Shovel early and often. 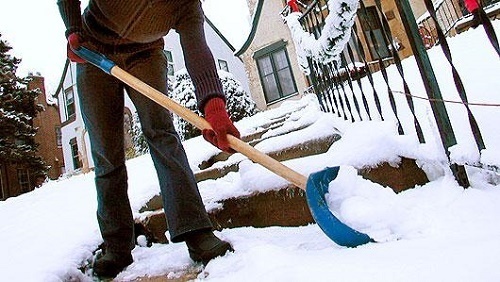 The more snow and ice you remove manually, the less salt you will have to use and the more effective it can be. Whether you use a shovel, snow blower, snow plow, or ice scraper, get out there as early as you can and keep up with the storm. You may even decide that salt isn't needed. Keep temperature in mind. 15°F is too cold for salt. Most salts stop working at this temperature. Use sand instead for traction, but remember that sand does not melt ice. Slow down. Drive for the conditions and make sure to give plow drivers plenty of space to do their work. Be patient. Just because you don't see salt on the road doesn't mean it hasn't been applied. These products take time to work. Use the right amount. More salt does not mean more melting. Use less than 4 pounds of salt per 1,000 square feet (an average parking space is about 150 square feet). One pound of salt is approximately a heaping 12-ounce coffee mug. Consider purchasing a hand-held spreader to help you apply a consistent amount. Sweep up extra. If salt or sand is visible on dry pavement, it is no longer doing any work and will be washed away. Use this salt or sand somewhere else or throw it away. Horse stable managers attend Water Quality and Animal Health Field Day. Next, Kirsten Barta, a rural conservationist for Hennepin County, explained how before European settlement, most of the county was covered by lakes, streams and wetlands. With the growth of the Twin Cities, water has become difficult to avoid when working with horses and other livestock operations. Barta explained that manure contains a lot of phosphorus which, when it reaches water, can cause algal blooms and excessive plant growth. And, as plants and algae die, the decomposition depletes oxygen from the water leading to fish kills and other problems. She noted that it only takes one pound of phosphorus to grow 500 pounds of algae. So, even just reducing a few pounds of phosphorus runoff can really add up over years and across many farms. Michelle DeBoer, U of M Equine Management PhD Candidate, stressed the multiple benefits to good pasture and manure management, including improved horse health and providing real cost savings in reduced feed and fertilizer purchases. DeBoer reviewed the benefits of rotational grazing and manure composting and the importance of soil health. Jim Kujawa, a surface water resource specialist for Hennepin County, discussed the process used by Joanie and Hennepin County staff to make her project a reality, including cost sharing programs, and how Joanie’s desires to eliminate mud from her stable areas also meant water quality benefits, making it a win-win situation. Joanie Stene, owner of Foxwood Farm, spoke about the reasons she pursued fixing the water problem on her farm. She discovered the farm she purchased was situated on a wet, poorly drained location. She has struggled with a muddy mess for years, noting the water would collect in the lots and turn green with algae. Her horses had recurrent abscesses, and one horse twisted his knee in the slop. 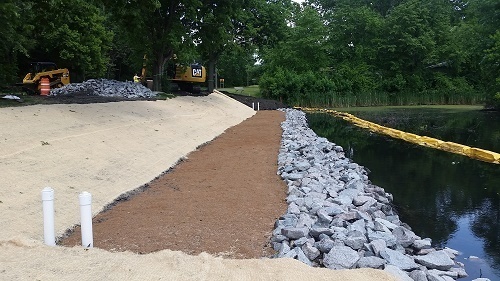 Another reason for moving ahead with the project was the untreated runoff that flowed into the Three Rivers Park District wetland behind the back pasture. 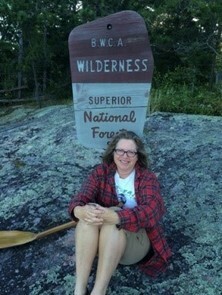 Her family enjoys the wetland and she considers herself to be a conservationist.